Finally, I am getting around to posting my Birchbox for this month (& just posting in general.) I have had the most chaotic month! Midterms, conferences, papers, & weekends away from home have all prevented me from blogging & well just about doing anything. On the plus side, because I am posting this so late, I was able to test out just about every product. The theme of this month's box was "give." There are several things I immediately loved about this box. 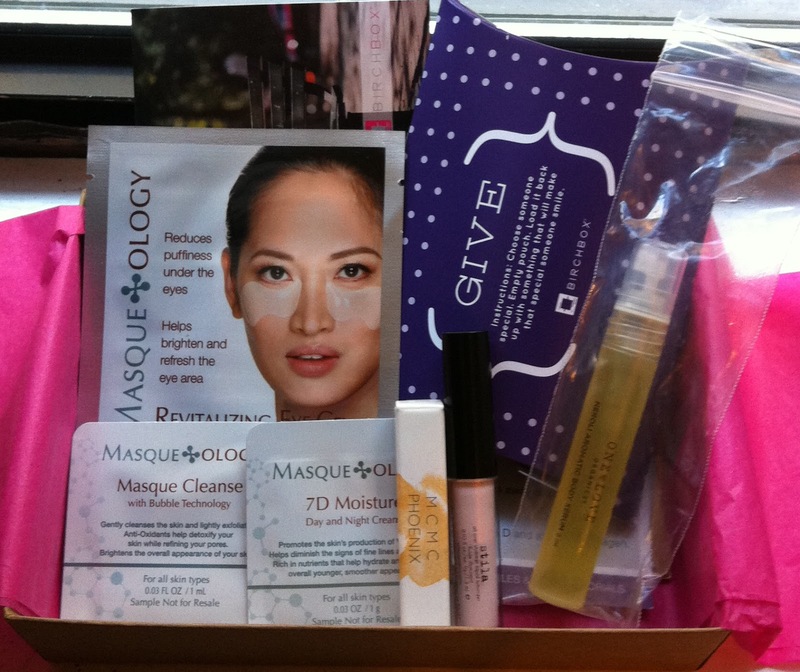 I loved the growing trend with Birchbox of featuring organic and small business products. I was excited to see the Brooklyn-based perfume and the organic body serum. I enjoyed the scent of the MCMC Phoenix perfume. Though I admit I'm not too sure how most people would feel about it; I think it is very unique. I like that it is still a sweet scent with the peach and vanilla notes, but it is warmer (perhaps "mature") with neroli flower and other floral notes. My next product, One Love Organics Body Serum, was also neroli scented but the actual citrus as opposed to the flower. It was a great sample size and smells just like oranges. It's a great light-weight oil that I imagine I will be getting a lot of use out of this winter. Another thing I loved was the stila luminizer. Of course, you can't go wrong with getting a stila product. I received the pink shimmer, if purchased, you receive a set of three with pink, rose gold, and bronze shimmers. I tested the shimmer as a brow highlight, cheek highlight, and over lipgloss and loved the look of it every different way. It is subtle until the right light hits and then it gives an amazing glow. I will definitely be using this over the holidays. I was also excited to try a liquid highlighting product. I found it very easy to use and also nice that it can be used in so many different ways. 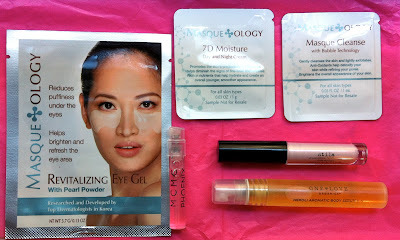 So as you noticed I received a lot of Masqueology products. The two small foil packets were considered "extras." I was excited to try all the products but was a little disappointed that half the things in my box were from one brand. I would have liked a little more variety. I enjoyed the Masque Cleanse. It has "bubble technology" and was a very cool texture, similar to shaving cream. The sample was exactly one-time use, so I have no idea as to it's benefits to skin. As to the 7D Moisture Cream, it was a good texture again a one-time use size so no benefits over less expensive products were seen. Apparently Birchbox thinks I need to be using more masks! Which is okay by me; I think they are a fun treat, and it's nice to try these luxury brands. Also with my lack of sleep lately I was excited to use this Revitalizing Eye Mask. However, unfortunately for me, one of the ingredients in the mask is caviar from salmon's eggs. Being a vegetarian, this mask isn't for me. I'm glad I checked the ingredients though and will have to give this mask to someone who will use it. I'm hoping the other Masqueology products didn't contain any animal products, but oh well, now I know to check the websites beforehand! Overall, I was so-so about this box. I think there could have been more variety. However, I am happy about the organic and small-business products. It's also nice to have six products to review for some more BB points. However, I don't think I found any products I would be willing to buy full-size which is disappointing. I wish I could have tried the mascara they sampled this month or the Mox lip balm they have been sending for a couple of months now. 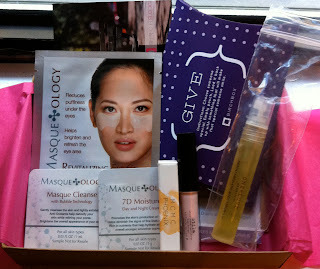 I'm hoping in my December Birchbox I will find some great new products! What was in your November Birchbox?